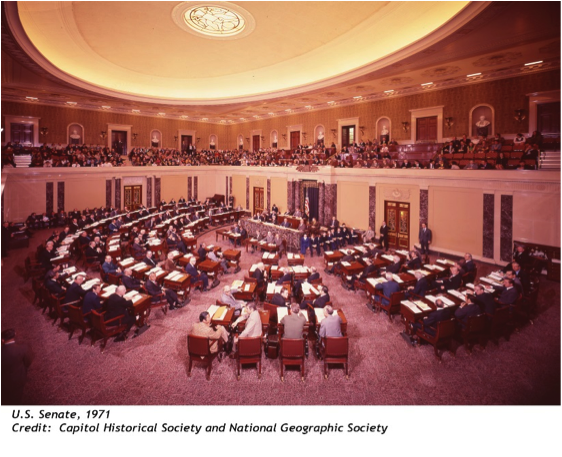 The primary audience for Senate debate was the pages – since for the most part, remarks were delivered to a chamber empty of actual Senators. While much of what was offered up as stirring rhetoric fell short, on occasion, the chamber was packed, and Majority Leader Mike Mansfield, D-Montana, could command attention and cajole the balky group into action, with dry, folksy wit. “The Senate was considering the appointment of Earl Butz as Secretary of Agriculture, and progress was slow. This was before the day when endless filibustering of presidential nominees was common, and Mansfield was frustrated by the unusual delays in what was typically a slam-dunk process. He finally declared that by failing to act, the newspapers would delight in printing this headline: ‘SENATE SITS ON BUTZ.’ Butz was confirmed.